White paper on crime 2004 Part4/Chapter2/Section3/2. Fig. 4-2-3-1 shows the number of juveniles newly admitted to juvenile classification homes since1949. The number of newly admitted juveniles showed a downward trend from1985until1995,but turned upwards in1996.In2001,it exceeded the peak in1984during the third wave of juvenile delinquency in the postwar era.In2002,it decreased slightly but rose again in2003by296(1.3%)from the previous year(see Appendix4-10 ). Fig. 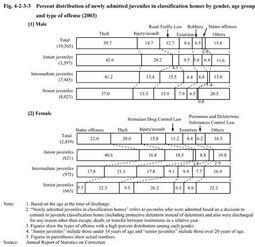 4-2-3-2 shows the age distribution of newly admitted juveniles in classification homes in2003by gender.Females are more likely to be admitted at a younger age compared to males. Fig. 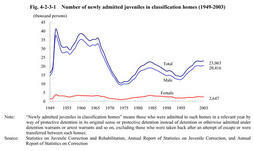 4-2-3-3 also shows the percent distribution of newly admitted juveniles in classification homes in2003by type of delinquency and by gender.Theft was the highest among male juveniles in all age groups,followed by injury/assault and extortion as far as junior juveniles are concerned.In both of intermediate and senior juveniles,theft was followed by Road Traffic Law violations and injury/assault.As for females,status offenses had the greatest share in juveniles,followed by injury/assault,and theft.In intermediate females,theft had the largest share,followed by status offenses and injury/assault,both of which had the same size of share.With regard to senior females,Stimulant Drug Control Law violations had the largest share,followed by theft.As female juveniles became older,the percent of status offenses decreased while that of Stimulant Drug Control Law violations increased. Fig. 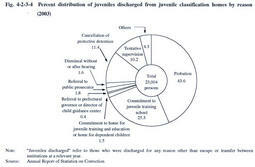 4-2-3-4 shows the number of juveniles discharged from juvenile classification homes in2003by reason.Probation was the most common reason,followed by commitment to a juvenile training school,and cancellation of protective detention.Juveniles referred to public prosecutors have risen since the enforcement of the Law for Partial Amendment to the Juvenile Law,etc. (Law No.142of2000)in2001and jumped in2003by about40%to423from the previous year.